Here’s a potato flake sourdough bread starter recipe that you can use to make a starter that will make yummy sourdough bread over and over again! This sourdough starter recipe is similar to the Amish Friendship Bread and is a really yummy starter that you feed like you do other sourdough. (For those of you who have the Dining on a Dime Cookbook, you can find this recipe on page 88.) These starters are fun to start and I have done them off and on over the years but, I must warn you, you must not become emotionally attached to them! Anyway, I hope you enjoy this Potato Flake Sourdough Starter recipe! This recipe can be used to make not only bread and cinnamon rolls but also dinner rolls and pizza dough. Stir together all the ingredients except flour in a 4-quart mixing bowl. Add flour a little at a time to the other ingredients, mixing well. Knead 5 minutes. Put dough into a large, greased bowl. Turn dough to grease the top. Cover bowl with aluminum foil. Let rise at room temperature overnight for at least 8 hours. Punch dough down. Turn out onto a floured board and knead. Divide into 3 parts and shape into loaves. Put into 3 greased loaf pans*. Brush tops with oil. Cover with a paper towel and let rise 4-5 hours longer. Bake at 350° for 30-40 minutes. Brush with butter and remove from pan. Cool and keep covered. Cinnamon rolls, pizza dough and rolls can also be made with this dough. Makes 3 loaves. *If you don’t have 3 loaf pans, place in 2 pans and make the rest of the dough into rolls or cinnamon rolls. I have never made a decent sourdough starter. It seems like the ones I have made and then used gave too much of a tangy taste to the the bread I made. I will have to try this one. try adding a bit of soda to the starter if it gets too sour for your taste. A friend of mine discovered she could spread out the starter and dry it. Then she powders it and seals it in ziplocs and sells it at the local Christmas fairs. It is packaged with directions for reconstituting and a recipe for sourdough bread. I love love to know how to do that also! Jill, I’d like to know how to purchase your gingerbread people if you sell to the public. I don’t know what would cause that but if you have had it for awhile maybe you need to start a new one. Maybe one of our readers would know. Tami I do sell to the public but I only once in awhile ship outside of Wichita because the cost to ship them is twice as much as what I charge for them plus I usually end up losing money because I don’t charge extra but it takes me sometimes 30 minutes to pack them up to make sure they ship ok without breaking which can be quite a challenge. I, too, would be very interested in the starter you can dry and package. Delores, do you think your friend would share the recipe and directions with you, and allow you to share with us? If you have to dispose of “Herman” starter, so sad :(, it can go right into the compost pile. Those good enzymes help aide in decomposition. Their brochure also has instructions for drying. Basically, spread out thinly and let dry for a few days, then run through coffee grinder or similar. hey Jill Don’t throw your starter away mix it with potting soil or clean compost in an open container then inn spring lightly scatter it over your garden or even make a tea. –I wouldn’t sweat it too much about using wild yeast for a starter. Even if you start the starter (how Zen…) with a commercial yeast, in a few months (especially with a “pancake” batter 166% starter, versus a doughier 100% version) your local wild yeast will have taken over anyway. (It’s very romantic that people in, say, Iowa, can talk about using a 200-year-old starter from France, but in truth, after a few weeks/months everybody winds up using their local bugs regardless.) The situation’s similar for potato or grape starters — after a few months, the local yeast take over. If you want to keep the flavor of a particular starter, you’ll need to refresh it with more potato or grapes every few months. A “batter” starter is equal amounts flour & water by VOLUME, aka. 166% water to 100% flour. A “dough” starter, aka. a “boss” or “grandmother” starter is equal amounts flour & water by WEIGHT, aka. 100% water to 100% flour. When in doubt, do whatever you grandmother did. PPS: Check out the FoodWishes “Follow the Sourdough” series on YouTube. He shows the whole process, including starting the starter (which still strikes me as Zen). To make sourdough crumpets, add 1 tsp sugar, 1/2 tsp baking soda, and 1/2 tsp salt to one cup sourdough starter. Cook on a griddle, with rings if you have them. To make pancakes, add enough milk to make a thinner batter. Either option’s yummy. Looking forward to trying this. I’ve made crumpets before but not with sour dough. For rings, I saved cans from canned pineapple. Cut out both ends. I used pliers to hold onto them because they can get quite hot as you cook. i told my daughter that i was going to do this and she told me “mom please! why?? ?” and she says this with these pleading looks in her eyes bc she knows that i will make something like that and it will probably explode in the fridge (sorta like when lucy and ethel made bread, remember that episode?) .. and i will have her taste test it .. hehehehehe 😀 .. or will have her come over and help me clean up the exploding bread dough coming from the fridge while my cat empty’s out her purse and lays on her stuff and “nests” (he does this and purrs super loud and he has this facial expression that is like “i have ur stuff and i am hiding it .. hehehe “… sorta like that cheshire cat look from alice in wonderland .. hehehehe 😀 ..
yes a true site to see ..
i did buy the box mix one (for the bread machine) and asked the clerk stocking the shelves if i could make the dough and just put it in the oven and bake and he said yes ..
I’m going to give this a try…..never made sourdough starter or bread before. It’s one of my January goals. Can you make this recipe in a bread machine? 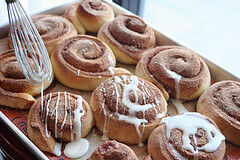 How do you modify your cinnamon roll and roll recipe to use the starter. Since there is moisture in it do you eliminate some liquid? Do you have a recipe that uses this starter for the pizza dough. If not can you just give some general guidelines? When you use your one cup starter in the cinnamon roll recipes, what happens to the other ingredients list? Thank you! I’m not exactly sure what you are asking Emily so forgive me if I get it wrong. Do you mean modify it for your own personal recipe that you have? If so I know the main difference between my regular recipe with yeast and the starter recipe is 1/2 cup less liquid (in a 6-7 cup flour recipe). But what I find works best is to just take the bread dough recipe we gave in the article and use it to make the cinnamon rolls or pizza dough or what ever you want. I not sure again what you mean about what happens to the other ingredients list. 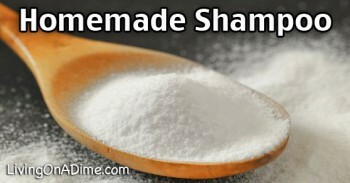 Again if you mean your own recipe you can either adjust the liquid or add a little flour although I have found it usually works best just to use the recipe specifically written for the starter like we have posted but you could try something else. I am sorry I wasn’t clear. I was trying how to figure out how to modify your (Tawra’s) cinnamon roll recipe (https://www.livingonadime.com/cinnamon-rolls-2/) by using the starter. Your comments were still helpful to modify my own recipes. Thank you. Also I didn’t realize you used the regular bread recipe for pizza dough and rolls. I’m not sure what your asking but if I were to make cinnamon rolls out the starter bread I would just roll it out and spread it with butter, cinnamon and sugar and bake. Is that what your’re asking? and use the starter to replace the yeast? I am not taking about using the starter bread dough recipe as cinnamon rolls, but modifying the cinn roll recipe to use the liquidy starter. I hope this is clear. I feel so silly that I can’t seem to ask my question right. Oh, I see what you’re saying. No don’t feel silly at all. I would just half the recipe and use the potato flake starter bread and then just roll it out, spread it with butter and cinnamon and sugar. yes Jill, that was what I was asking, but couldn;t frame the question right. one more question for you ladies. once you are into the cycle and feeding it every four days, do you let it sit and room temperature for 24 hrs each time or can you just feed it and put back in the fridge? No after you feed it let it sit out all day (about 8 hours) then put it back in the fridge. Don’t forget it needs the room to be nice and warm or in a warm spot some place. thanks, I may have killed my first Herman, by feeding and plunking it back in the cold, so I’ll start over :0. However, the pizza, rolls, cinnamon rolls, and bread makes my family feel like I am ‘providing’ for them, rather than scraping something together. I work really late, so my bread is second rising more than the 4-5 hours (more like 11) but is still seems good. Any harm letting it rise that long? The main thing which happens when bread raises too long is it forms huge air pockets and when it is baked can sink in the middle or shrivel. It is still eatable though. It will look fine until you go to bake it then it will crash and burn. Emily, I get home late too and up early. I let my bread/rolls whatever rise once, roll out and shape and put on pans (often cin rolls) and then cover with plastic wrap and put in the fridge. Then as soon as I get up I let put them out in a warm spot to raise. Usually by the time I’ve showered and kids are getting up it has risen and I bake it. This is really good for raised donuts that you want to make up the night before so that you don’t eat breakfast at lunch time on the weekends. I was wondering if one could use rice or tapioca flours in the actual baking part to cut down on the gluten? The beauty of true sourdough is that a lot of the glutens are broken down/predigested by the yeasts due to the long rise time. True some people who don’t tolerate gluten can eat true sourdoughs with no problems. Modern quick-rise yeasts, while giving reliable results, don’t give sufficient time for the process to happen. I love sourdough, and learned to make a starter from my Mennonite neighbor when I was younger. I had the same starter for 5 years. I went on a 3 week vacation with instructions on how to care for it next to the container. Poor starter was purple and pink when I got back. Was not screwing with that science project and had to pitch it. Oy! I love my stuff super sour also, and the pancakes and bread were amazing. I work too hard now a days, I miss those days I could just cook. I am currently on modified bed rest for my high risk pregnancy, so I will be experimenting with all of this again! Thanks for the recipes. Do you use bread flour with this recipe or all purpose? Thanks! All purpose. When most recipes calls for flour it usually means all purpose unless otherwise stated. Hope that helps. Thanks. I thought that is probably what you meant, but I’ve seen some with bread so I just wanted to double check. Thanks again! Hi! I recently received the potato flake starter from a friend. Her directions were to feed it after using it for the bread and then to leave it out overnight before refrigerating it. I made dough last night, fed my starter, but immediately put it back in the fridge. Oh no! Do you know if there’s any way to save it or have I completely killed it? I think you can save it by just putting it back out again. A few questions back a person asked you if you could use rice or tapioca flours in the actual baking part to cut down on the gluten? I too am curious about that question since I have a daughter with a speech delay and have read Gluten may be responsible. She LOVES bread and most of your gluten free breads you buy at the store are ‘YUCKY’ in her words. If you could answer this question it would be great or if you have no idea just let me know. Thank you in advance for your time. Hi! I made your starter and bread a few weeks ago. The first time the starter was out it bubbled well and make good bread, but with each addn feeding there was less bubbling and less rise in the bread. Part of the problem may have been from the fact that the chlorine filter on our faucet needs replacing, but I have an addn. question before I get started on my replacement starter. In your directions you say to let the starter sit out for 24 hours after each feeding, but in the comments I saw mention of only leaving it out for 8 hours before making your bread. Which is correct? Thanks! Kristi part of the reason I stopped messing with my starter is it is something you really have to baby and have patience with. First the chlorine in your water has nothing to do with it. The other thing there are as many ways and different directions to do starter as there are people. You get people leaving it out 8 hrs. to 24 hrs. plus all kinds of different things in between. What happens is part of the reason all are different is because you have a different kind and amount of “bacteria” or what ever you call it floating in each persons air which is what helps make it. Then your room temperature is different and can change through out the day and at different times of the year. If you have problems you might google and look at a few different ways of doing it. I think the main thing is to leave it out at least 8 hours but you may have to try say over night or fiddle with the time. You might try making your bread in the evening, let the bread sit rising and leave the starter all out over night and then bake the bread in the morning and put the starter back in the fridge. Also don’t forget sour dough bread does take much longer to rise then regular bread so panic if it seems like it isn’t rising. It does take some babying and like I said that is why I finally gave up on it. It was one of those things I wanted to know how to do but it stressed me out to have to keep worrying about “Hermit” in the fridge. Is there a way to half the recipe? For example, if I only want to make one loaf at a time? Everything I’ve found online says to use 6 cups of flour. That is a lot of bread for just the two of us! 🙂 I’d like to save money by not using so much flour at one time. Thank you for your post! Amy, I would just half it. It should work. Thank you! Would I just feed the starter the same? And, just discard 1/2 cup of the starter each time? Has anyone made the Sourdough bread in a Bread maker? If so could they tell me how they did it please? Can you build up the amount of starter you have by not throwing out a cup but just feeding it. Like when you need more for Christmas or Thanksgiving? You need to discard it because it helps to keep the ph balanced in the starter and the yeast can somehow work better. You can use the discarded started to bake up something that you could maybe save and freeze for when you need it or have 2 batches going at a time. I just pour a cup into another jar. I ususally have 6 to 8 starters in my fridge at anyone time. That was I can make many loaves near holidays etc. I generally trade weeks feeding the starters and using. (mine can easily go 10 days between feedings). If I just need to feed and not bake for some reason I either throw out…or make even more starters. Convenient to have to give to friends when they ask as well. How do I revive my starter? It wasn’t raising good, so I added some yeast to the warm water when I fed it, so I almost killed it. Now it barely raises. What can I do to revive it? I had checked that web site, but it’s not for the starter made with potato flakes. It asks for flour in the starter, and the potato flake starter doesn’t use flour, till you make bread. I need to know how to revive a starter using potato flakes. Mine kind of works, but barely raises. It needs a boost of some kind. Maybe one of our readers has the answer for you because I quit using starters because they take quit a bit of commitment. If not you might just google how to revive potato flake starter. When I have a starter not doing so well, I will feed it every 3 days for a week or so…that usually revives it well! You can add dehydrated currants or raisins. Attracks wild yeast like crazy. I used this many years ago and had two going at all times. I usually made 4 loaves of bread and cinnamon rolls. However I can’t remember what kind of flour I used. Do I use plain flour. Bread flour. Or self rising (I doubt that one). I am starting two tonight. One for me and one for my daughter. Thanks! I have had a sour dough starter for 30 years and I don’t feed unless I am going to use which sometimes is at least 6 weeks. Sometimes it’s better and works just as well. I see where you only feed your starter when you are ready to use it. I have a starter that said to feed every 3 to 5 days. With that, I should have feed it a week ago. I thought since I forgot to feed it that I would need to throw it away. Do you think if I feed it now it would be okay? If so, do I just feed it as usual or should I feed it twice? Also I have seen where you should take the starter out of the frig and let it set awhile before you feed it…I haven’t done that before. Your starter will be fine. Just start your feeding routine again and it is be back to normal right away. Anyone have a good GF recipe using the Potato Sour Dough Starter? I have had this starter a long time and would love to use it to make GF bread for friends. I am not seeing this online. There should be no concerns with potatos, sugar, and the yeast?? My sourdough starter doesn’t seem to have enough bubbles. I have feed the first time and left out all day. It just has a little bubbles on top. What’s going on. 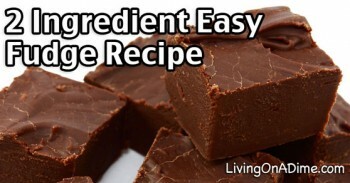 I “THINK” this is the one recipe that I have been searching for. I used to make this years ago when my boys were still at home. Recently they have asked for it. I hope this is the right one. I just had to laugh at your description of your emotions concerning the starter. I too, had finally given up after the same worry of keeping it going when traveling full time in an RV for several years. Where to put it on a travel day without it spilling or how can I bake bread on a travel day. It was so exhausting! I then lost the recipe and have been looking for it again to no avail. Your recipe sounds like the one that I used and loved. I may just try it again. You did indeed bring back memories for me. I am wanting to make about 5-7 loaves of bread at one time. Can I hold onto the starter, instead of disgarding it, so that I can have the quantity of starter I need when it comes time to make the bread? Will that cause a problem with the taste or cause a reaction and the bread won’t turn out right? Yes you can hold on to the disgarded starter and feed it too like the original. I may have over looked it but I didn’t see what the ingredients are to feed this starter or how often. Can you help me out? My bread isn’t rising much at all and it is turning out very dense and heavy. It has a great flavor though. I’m wondering what I’m doing wrong. The potato flakes I’m using has butter added. Could this be the problem? Your thoughts please!! Sandra it is hard to know without seeing it or watching you make it but it could be the butter in the potatoes but be sure to check and make sure your yeast is ok. To do this sprinkle it in very warm water and let set for 3-5 mins. If it foams up it is still good if it does nothing then it is dead. First I’m sorry if this question has already been answered. I just don’t have the time to read all of them. Please forgive me!! I have been trying to make the potato flake sourdough bread for months without. I made 2 starters so I can make bread whenever I want to. My starters are bubbly and smell terrific, so I don’t think that’s the problem. I mix up the bread and leave it at least 8 hours to do its thing. The next day I punch it down and put it in my bread pans and allow it rise 4 to 5 hours. I check on it to be sure it has proved long enough before I preheat the oven. I bake it in my 350 degree oven for 40 minutes. The bread comes out a nice golden brown and a 190-200 degrees. But when I check it, I’m not getting the hollow sound I should be getting. 😕 The bread comes out “wet”. I don’t know what else to call it. It’s like it isn’t done but I bake it 40 minutes! Should I bake it longer? If you have any ideas, please let know!! Also, according to this recipe this should make 3 loaves. I will only make 2 loaves. If I make 3, the loaves will be very small. Even when I make 2 loaves they are small. I was wondering if there’s a way to add more flour? Most recipes add 3 1/2 cups flour to get a full size loaf. If I can get the wet bread issue, with your help I would love to be able to modify the recipe to get the 10 1/2 cups of flour into the recipe!! I’m not one of the people that can whip up a new recipes. Do you have any ideas to modify this recipe? I really love your book!! I’m going to buy one for my daughter! There’s so much good information in it. I made most of my Christmas gifts last year and I’ll be doing it again next year!! I am not sure what to tell you Cindy. First I think part of the wet problem and having to bake it so long is because you are making only 2 loaves and not 3. You are adding way more dough to the pan by doing 2 so it is not cooking all the way through. Also all the recipes for this type of thing that I looked up do make the 3 loaves with the 6 cups of flour so am not sure why you are having problems. Do you have regular sized loaf pans that you are using? I got confused too because I am not sure where the 10 1/2 cups of flour came from and why you want to add that much flour. You need to be very careful with bread recipes because unlike casseroles or muffins or something like that they are not very easy to adapt and change. If you add too much more flour what usually happens is the bread will get very heavy so I am not sure you should just add more flour. I really think it is the fact that you are baking it in 2 loaves and not 3 but I maybe wrong. It is so hard to tell with out being there to watch what all you do because there are so many factors in bread making. Sorry if I wasn’t more help but maybe one of our readers could help you more. How long do you knead the three loaves before you put them in their pans? You do it before you feed it.